A few months ago I was helping an old friend purge her belongings for a move. She is a book lover, but because she was moving to a much smaller place she was faced with having to say goodbye to much of her collection. I’m pleased to say that she wasn’t having too much trouble filling up the ‘to donate’ box. But she held back one, saying she absolutely had to hold on to it. It was a book of inspirational quotes that she’d had for years . It was dog eared, and the margins were marked up with her own thoughts about the quotes. I heartily agreed that the choice to keep it was a good one! After I left, I began thinking about quotes myself and all the those that apply to organized living. As I was reflecting, I also realized most were incredibly simplistic (that’s a compliment – I love simplicity!). Just a few words convey ideas that, if followed, make life so much easier. Wow! That one sentence sums up the very essence of what being organized is all about. But if I were going to add anything to the statement it would be this: Designate a home based on where and how an item is used. Do you have things in the right place or the wrong place? If you have to stop and think about where you stashed something, that is a clear sign that it is in the wrong location. If you have to fetch a regularly used item from a far away location, that’s another sign that the item lives in the wrong place. This just adds work on both ends – retrieving and putting away. It erodes efficiency. And it increases the likelihood that clutter will take root. So, what can you do? First of all, don’t try to re-home all your belongings as once. If you attempt to do that, most likely it will feel like a bad game of musical chairs and you will probably wind up frustrated. Instead, as you initiate an activity, stop and think about the steps involved. 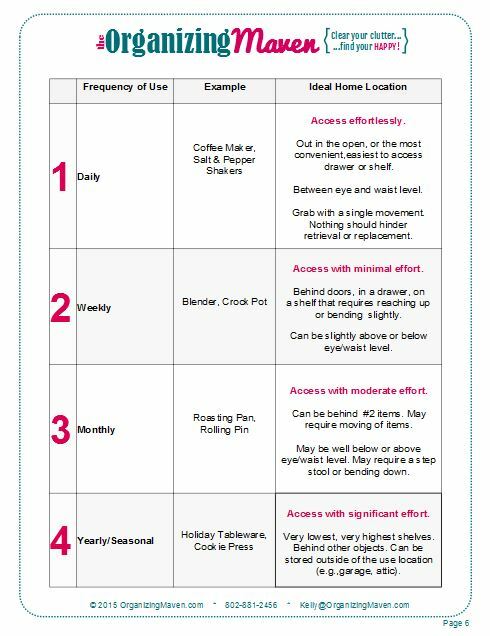 Evaluate whether things could be placed in easier to access locations. If the answer is yes, tweak your set up. See how it feels. Pay attention to how easy it is to put stuff away. Expect a little trial and error. You may have try things a few different ways before it feels just right. Why would you want to put this much effort into creating ‘just right’ homes for your belongings? First of all, you will save time. Lots of time as a matter of fact. If you can be more efficient each time you embark on an activity, you will have more time to dedicate to other things. You will also exert less mental and physical effort, that means less stress. Another bonus, you will gain a real sense of control. Just knowing that you can lay your hands on what you need when you need will lower anxiety. If you live with other people, embracing the idea of a place for everything means stuff will not get ‘lost’. If it has a home, everyone can participate in keeping clutter at bay, by putting things away. The benefits are enormous. Reap them by reacquainting yourself with the space in your home. Look at it with a fresh eyes, assess what you do where. Then take a look at how you manage storage. Does it make sense? You might be surprised at what’s where. With a few tweaks you might be equally surprised at how much more efficient you can make it. To make it even easier, grab this free How To Organize Your Stuff Guide & Where To Put Things Tip Sheet. Have a question about storage, and anything else? Feel free to ask away – us the comment section below, or better yet, pop over to our private group page. Our group is a great place to find support and inspiration, plus tips and members only goodies! 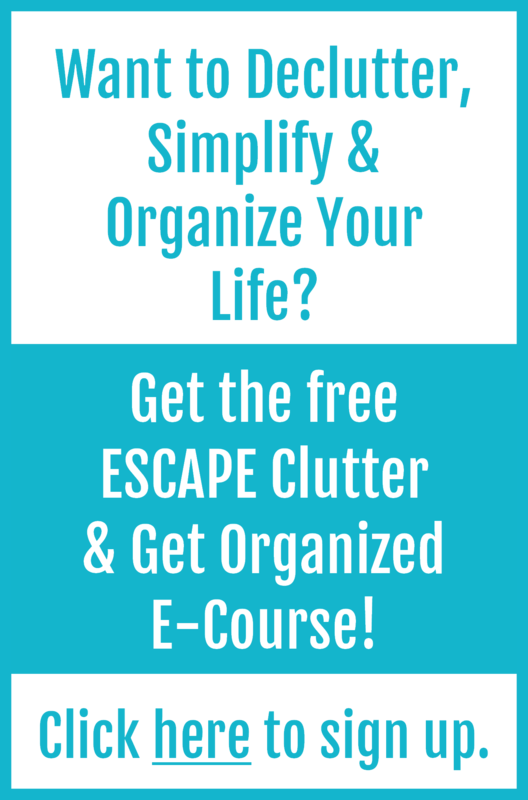 If you want to seriously good decluttering and organizing help, I encourage you sign up for the ESCAPE Clutter and Get Organized E-Course. It’s a free resource to help you simplify life and manage your time.